Dive and snorkel Halmahera, the heart of the Coral Triangle, with Weda Reef & Rainforest Resort – the pioneers who has been diving around Halmahera since 1989. Diving and snorkeling at the untouched reefs of Weda Bay at the East coast of Central Halmahera, Maluku, Indonesia offers everything from pygmy seahorses, turtles, giant groupers, sharks and schooling fish; from steep walls, some black sand sites with critters to lovely shallow coral gardens and a historical Japanese WWII shipwreck. Diving and snorkeling are extremely exciting here. But also very relaxed. Hardly ever we encounter strong currents and you can also make incredible beautiful shallow dives. Perfect place both for beginners as for very experienced “seen it all” divers. And it is hard to find a better place for snorkeling in the world. Many of the reef are situated 10 kilometers from the shore. The top of the reefs are in excellent condition and very rich in fish-life. 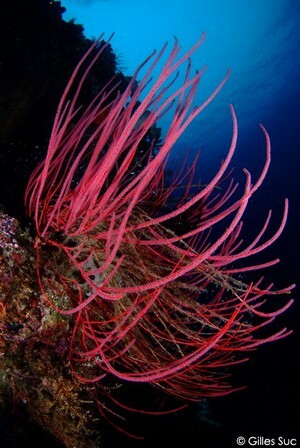 For images of this underwater paradise, please have a look at our gallery of underwater images. Also, here you find the a description of the Weda Bay dive sites and reefs for snorkeling..
Our three fiberglass diving boats are fast, safe and comfortable. We visit more than 40 sites for snorkeling and diving, within a range of max. 35 kilometers (1 hour boat trip) from the resort. Visibility at Weda Bay depends on weather conditions. The off shore reefs and sites on the North shore usually have a visibility of 20 – 40 meters, while the visibility of the East shore dive sites is between 10 – 25 meters. The house reef (Pasir Putih, 5 minutes boat ride) visibility is 10 – 25 meters. The beach/shore directly in front of the resort is a great place for diving and snorkeling too – but depending on the weather conditions and waves the visibility is 1 – 15 meters. Water temperature varies very little and you can expect temperatures of 28 – 30 degrees Celsius the whole year through! Weda Reef & Rainforest Resort is open the whole year. However, due to strong winds and waves during July and August, we do not offer any diving from 1 June until 15 September. You will be asked to sign a “Standards of Safe Diving Statement” before you start diving with us. You will need your dive certification. The minimum age for scuba diving with us is 15 years. If you have any medical problems that may affect diving, you will need written confirmation from your doctor that you are able to dive. We do not impose time limits on dives, but we do not allow decompression dives or dives deeper than 33 metres. You have to use a dive computer, because it is likely you will be diving more than once a day and on consecutive days. You are asked not to touch anything underwater that is alive. Please do not ask the guides to manipulate the animals in any way. Observe the underwater environment from a reasonable distance and do not harass the creatures. Take nothing but good memories or pictures. Leave nothing but bubbles.